Adolescence is such a crucial time in the life of a person. It is often during this time that persons make choices about how they plan to live their lives. These books give youth examples of how a holy and joyful life can be lived in accordance with God's laws. The saints and their exciting lives are such great inspirations for youth. The young persons in your life will no doubt benefit from learning about these heroic characters and hopefully they will want to model their own lives after these wonderful examples. 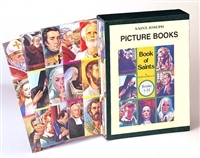 Picture Book of Saints by Rev. Lawrence G. Lovasik - Catholic Saint Book, Hardcover, 125 pp.